White Sands National Monument is part of the Tentative list of USA in order to qualify for inclusion in the World Heritage List. My visit in late November to White Sands National Monument is truly a unique experience. White Sands is an easy inscription, there is little to persuade in any nomination file about OUV. The largest Gypsum Sand Dunes in the world (by far), and some of the most unique symbiotic relationships seen on this planet are found in this remote region of New Mexico. White Sands is surely of exceptional value and a missing gap on the world heritage list. However, there are different factors that may affect this nomination. Firstly, much of the monument is surrounded by the White Sands Missile Range, which is active and causes closures to the monument itself, and the major highway that crosses Southern New Mexico. In fact, there is a "cooperative use" zone inside the national monument that is periodically used by the US Military! Furthermore, there is a US Air Force Base nearby and an Immigration checkpoint in the immediate vicinity of the park entrance. US Nomination Files rarely include buffer zones, and I don't expect one here. I cannot imagine UNESCO & IUCN will have nothing to say about potential factors affecting the property. My visit lasted 4 hours. The hike at the end of Dunes Drive is nothing short of sublime. Stark white dunes all to yourself, with 360 degree panoramas that are stunning, will leave most visitors giddy with excitement. My wife and I also chose a guided sunset hike; here I learned about the unique symbiotic relationships in this habitat that make life possible. The sunset was a photographers dream, the surrounding mountains turned almost pink, and the dunes whitened even further as the moon began to rise. The Gypsum Sand is as white as sugar or salt, and after sunset it truly feels as if your walking in a powdery snow. Keep in mind White Sands National Monument is pretty remote, the nearest city is Las Cruces, not really a major stop for tourists. Driving straight from Los Angeles would have taken 12 hours, I made it into a 4 day trip in Southern Arizona and New Mexico. The entrance fee is a steal at $3 per person. I would recommend visiting during the late Fall or the Winter, when temperatures are a pleasant 55-75 degrees (F). I will be very curious when this nomination is completed, and how it is received by IUCN and the WHC. 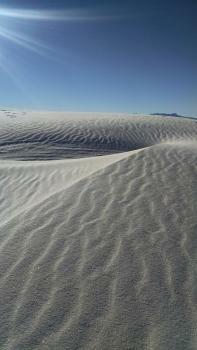 It was very fascinating to visit White Sands, also to go there, I took the way from Carlsbad Caverns. The feeling that I remember was the very warm surface but if I just dug some decimeters down, it was rather cold. Perhaps there must be some more to show and I also remember that it was some kind of military area(1994) and the military could close it down when they needed. Perhaps not so good in a HHS.